Typically when you think of potato salad you think of a goopy and mayo laden bowl of mushy potatoes. Sure, there is a time and place for this type of side dish (mainly when you are in a rush on your way to a party). However, it is not the only way to eat potato salad. We were sent a copy of the Zack Brown’s (you know, the guy who crowdfunded a bowl of potato salad on Kickstarter) The Peace, Love, & Potato Salad Cookbook which offers home cooks 24 recipes (some don’t even have mayo in them!) and new ideas on this classic dish. 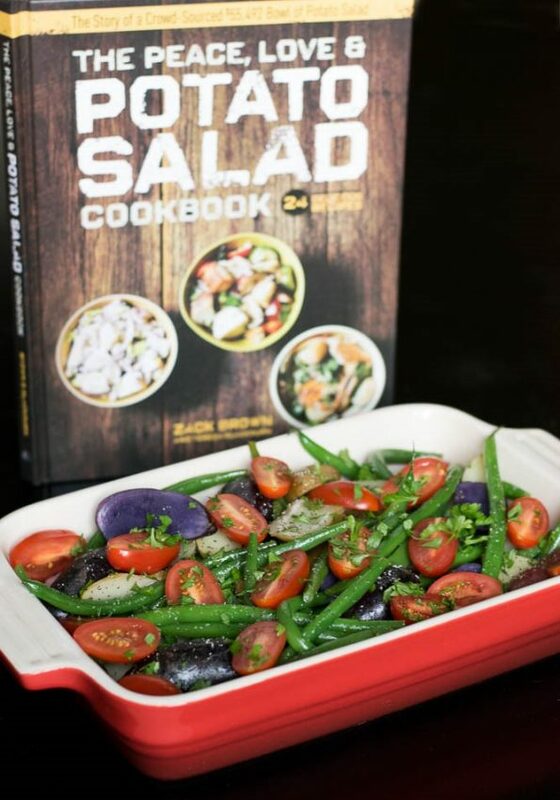 When we first started digging into this cookbook, the most striking feature was how beautiful each potato salad looked (we might be biased as we really enjoy potato salad already). The book is divided seasonally with different variations fitting to that season. The potato salad we made, The Green Bean and Fingerling Potato Salad, came from the Spring section. True to it’s section, it was light and perfect for a spring meal. The colors were vibrant, as were the flavors. The recipes range from classic to unique (Grilled Flank Steak and Potato Salad Tostados anyone?). There is even a recipe for Spicy Korean Potato Salad that includes kimchi in it! There are so many delicious sounding recipes that we can’t wait to try! There is something for everyone. Mayo lover or not, you will find the potato salad for you! How do you like your potato salad? What’s your favorite recipe? Let us know in comments below or use the hash tag #GeekEats! Blanch green beans in boiling water for 3-4 minutes, then plunge into ice water. Drain and place in a large mixing bowl. Put potatoes in pan, cover with cold water, and bring to a boil. Reduce heat and simmer until potatoes are just tender. Drain and return potatoes to the pan. Drizzle 2 tbsp of the vinegar over the potatoes, toss gently, and let sit for 10 minutes. For the dressing, mix together remaining 2 tbsp vinegar, olive oil, salt, and pepper. Drizzle dressing over beans. Add the potatoes to the bowl with the green beans. Gently toss. Sprinkle tomatoes and parsley over all. Taste and adjust seasoning to your liking. Serve on a platter with additional chopped parsley if desired. Haricots verts is French for "green beans." 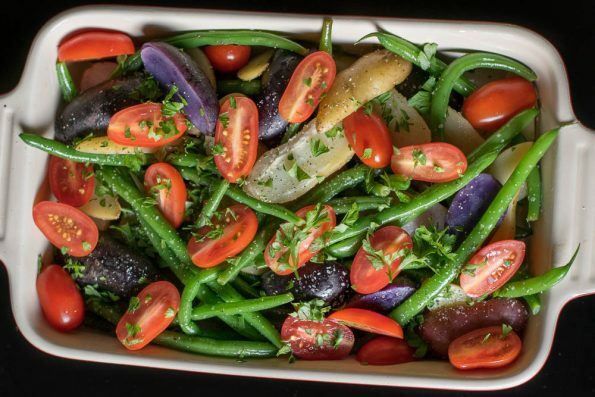 They're often smaller, thinner, and more tender than your average green beans, which makes them perfect for this recipe. If you can't track them down, just use the smallest regular green beans you can find. *The Geeks were given a review copy of The Peace, Love, and Potato Salad Cookbook to facilitate this write-up and interview; Recipe shared with permission from Spring House Press. All opinions are wholly our own. View our Disclosure Policy for more info. I really enjoy potato salad. I like to try it different ways each time I make it. What a cool cookbook! It really is such a neat book! I’d never have thought of some of these recipes!